Nancy Proctor is Director of The Peale Center for Baltimore History and Architecture and of the MuseWeb Foundation, the new non-profit initiative of Museums and the Web, as well as Co-chair and Co-editor with Rich Cherry of MW’s international conferences and publications. Previously Nancy was Deputy Director of Digital Experience and Communications at the Baltimore Museum of Art (2014-2016), Head of Mobile Strategy and Initiatives at the Smithsonian Institution (2010-2014), and Head of New Media Initiatives at the Smithsonian's American Art Museum (2008-2010). With a PhD in American art history and a background in filmmaking, curation and art criticism, Nancy lectures and publishes widely on technology and innovation in museums, in French and Italian as well as English. Nancy Proctor created her first online exhibition in 1995 and went on to publish the New Art CD-ROM and website of contemporary art in the UK in 1996. She co-founded TheGalleryChannel.com in 1998 with Titus Bicknell to present virtual tours of innovative exhibitions alongside comprehensive global museum and gallery listings. TheGalleryChannel was later acquired by Antenna Audio, where Nancy led New Product Development from 2000-2008, introducing the company’s multimedia, sign language, downloadable, podcast and cellphone tours. She also directed Antenna’s sales in France from 2006-2007, and worked with the Travel Channel’s product development team. Nancy served as program chair for the Museums Computer Network (MCN) conference 2010-2011, and co-organized the Tate Handheld conference 2008 & 2010. She started MuseumMobile.info, its wiki and podcast series in 2008. She was Digital Editor of Curator: The Museum Journal from 2009-2014, and is now on the Journal's editorial board, as well as on the Board of Directors of the Omnimuseum Project. Tips from oldies and newbies to Museums and the Web; add yours in the comments below! Don’t be shy: about introducing yourself to strangers; what you get out of the conference will increase exponentially with every new colleague you meet! Wear your badge! This will help and encourage people to introduce themselves and ask about your organization. Tweet with vigor! Use social media and the conference hashtag, #MW2013, to find people and what’s going on – even if you are not normally a Twitter user and don’t contribute to the twitter feed yourself! Get a roommate: it’s a great way to meet people! Eat heartily! Go to the hotel bar at the end of the day for drinks; everyone will be there! Follow up after the conference with the people you met with an email, a Linked In invitation, a tweet or other short message to let them know you’d like to stay in touch. Pre-conference workshops: these are optional and cost extra on top of the main conference registration. They are an opportunity to learn or deepen a skill in workshops led by museum colleagues who have depth and breadth of experience in the field. Local museums: try to build time into your schedule to see local museums, and reach out to colleagues there both before you come and while visiting their town. They are often happy to show you around and give you behind-the-scenes views into how they work. Start a conversation: propose a “Salon” session (for Thursday afternoon) or a “Birds of a Feather” breakfast roundtable topic (Saturday morning). Spend the time before then inviting people to join you (in person and via social media) and then blog, tweet, or otherwise share your experience afterwards. Find a mentor: This is a generous and experienced community, and we all remember our first time at MW. Don’t be afraid to ask people to help, to guide you, and even mentor you beyond your time at MW. The value of even the most experienced attendee’s knowledge increases exponentially each time that expertise is shared, so you are doing your mentor a favor too by building on what they already know! Try something new: go to a session you know nothing about to expand your horizons, skills, and professional connections. Even if you don’t pursue that topic immediately, you’ll be a better-connected and well-rounded museum professional. Try something crazy: act on at least one impulse per day! What’s happening next? Check the “Live Program” feed. Transportation: Wondering how to get to evening events? Check the “Live Program” feed. Presentation logistics: All presenters will have use of a projector, power and Internet connection. Coordinate your presentation time with your session chair if you are in a multi-presenter session, and respect the presentation order in the program as many attendees “session hop”. Demonstrators have an exhibit hall booth, sign, table, chair, monitor as well as wifi and power for their 1 hour sessions. More presentation tips can be found here. Pace yourself: Try not to pull an all-nighter the first night, as you’ll want to stay up late every night with all the great conversations going on! Go with the flow: Don’t plan too much, and be willing to make last-minute changes to your plans! Please add to these tips and help us answer other questions in the comments below! As part of this year’s conference, we are excited to introduce a new media exhibition component into the program. In the spirit the “hypermedia installations” curated by Xavier Perrot that were features of earlier ICHIM events, MWX2013 presents a “prototype” exhibit focusing upon Augmented Reality. Museums and the Web‘s exhibition initiative is curated by Vince Dziekan, and our inaugural exhibition features works by John Craig Freeman, Future of Reality and Will Pappenheimer that emphasise how the innovative potentials of AR can be used for tactical intervention. In recent years, thanks in large part to increased accessibility to the technology through proprietary and end-to-end services (such as Layar, Aurasma, Junaio), AR has become one of the most interesting areas of development in the “musetech” landscape. 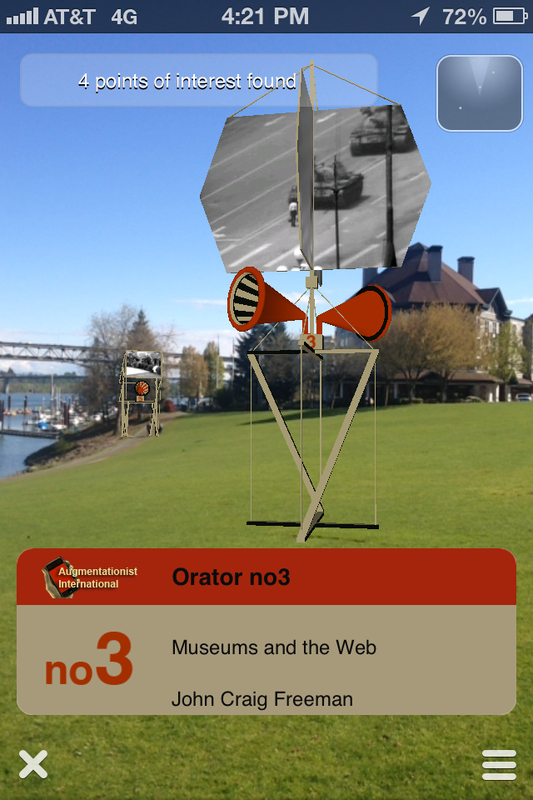 Today, the breadth of possible applications of augmented reality content in museum interpretation is represented by innovative projects spanning cultural heritage (such as the Pure Land augmented reality edition produced as part of the Digital Dunhuong project) and audience engagement strategy (the Site app produced by the Museum of Contemporary Art, Sydney is just one example for amongst many). However, while the conception of augmented reality can be traced back to Adolfo Bioy Casares’ novel, La Invención de Morel (1940), artistic precursors of AR go back to the early mediated interfaces produced by Jeffrey Shaw (most illustratively Golden Calf, 1994) and the mixed reality environments created by Raphael Lozano-Hemmer (Body Movies, 2001). 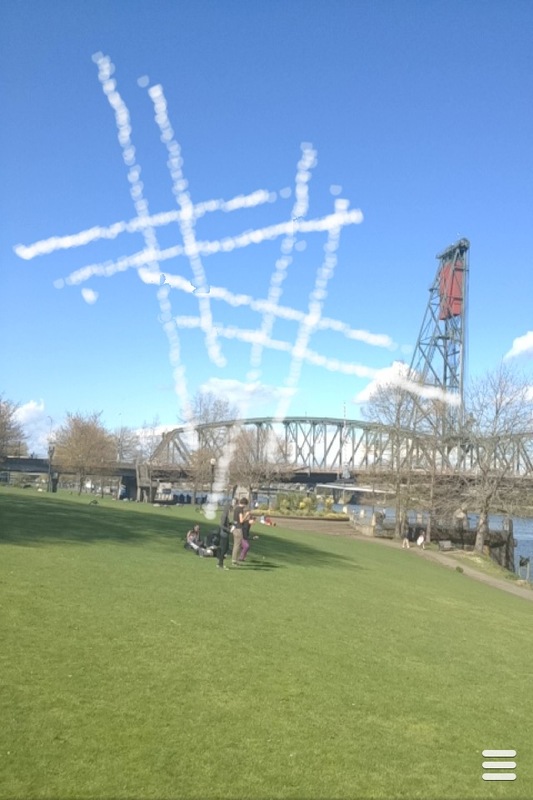 The curatorial strategy for MWX2013 adopts an “interventionist” approach, inspired by how the work of these contemporary new media artists harnesses the potential of AR to create artworks with a deceptively playful, yet critical edge. 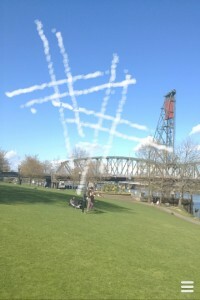 The resulting exhibition is “blended” into the main program of MW2013 in Portland in a manner that we hope will both surprise and engage delegates. Support for this project is acknowledged from the Australia Council’s Visual Arts Board, along with other institutional and contributing partners. MW2013 Speaker Training: Free Webinars! Would you like to hone your presentation skills and really nail that MW2013 presentation? Are you a first-time presenter at Museums and the Web, wondering what your audience will expect of your presentation? The target audience of the sessions are all MW2013 presenters and session chairs, with a particular focus on first-time-presenters. An introduction to the conference, the different session types and what to expect as a presenter. Presenter tips from MW Veterans to help shape you prepare for your presentations. A live Q&A where participants can get answers to their MW questions ahead of the conference. Hosting for the sessions was kindly provided by JHU Museum Studies Program. You can also sign up for the pre-conference workshop, “Developing Short Form Video Elevator Pitches” led by Ryan Donahue on Wed 17 April. MW2013 speakers get their fee for this workshop refunded as a $175 hotel room credit.